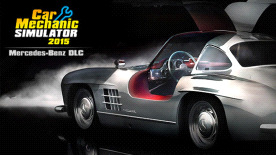 Car Mechanic Simulator 2015 is the highly anticipated sequel to PlayWay’s extraordinarily successful 2014 release. Player input has guided PlayWay to reach new heights in the game’s design with an improved Car Mechanic Simulator with new features, cars and parts. Take on the role of the car mechanic and repair cars for your clients. Spend your hard earned money on expanding your workshop and improving your skills. Buy worn out cars, renovate them and flip them for profit or become a famous car collector. Manage your business well and you will surely succeed in the market. Copyright (c) 2015 PlayWay SA. All rights reserved.